I seem to be having a run of cards I'm struggling with. Or, more specifically, I am having a run of struggling with colouring images. Poor SK8R Ronnie here, (from the Time 4 Tea Designs April Release) had to have constructive surgery! So, maybe ignore my colouring for now, and enjoy the, erm, fun papers! Awwwwwww, your coloring is as good as always! And you are right the papers are fun. I love the layout! 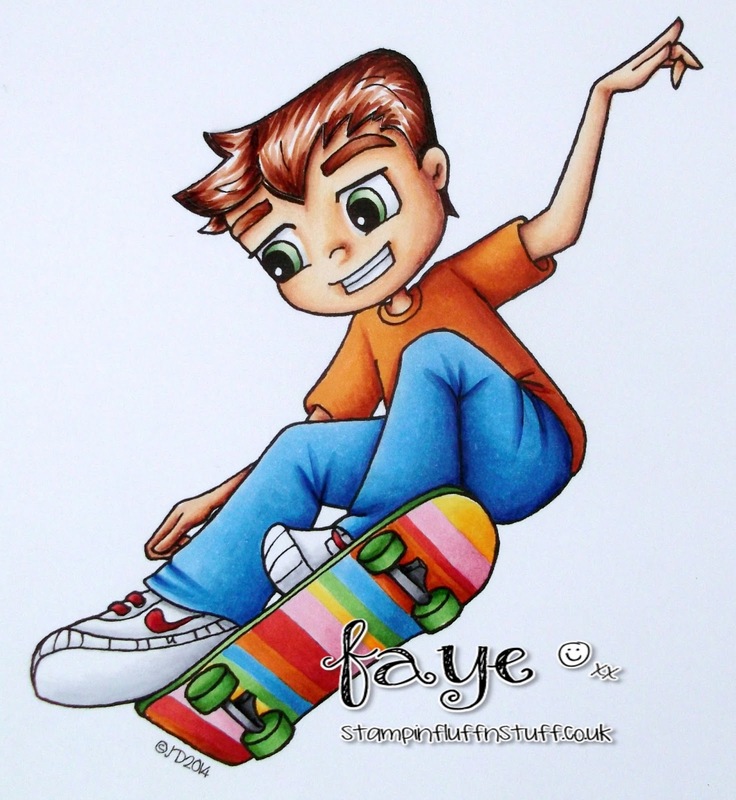 Your colouring of that fun image looks perfect to me Faye, I love his rainbow coloured skateboard and fabulous layout. Can't seem to work out where you went wrong with the colouring!!! You must have done a great job covering up your mistakes, cause I sure can't find any. 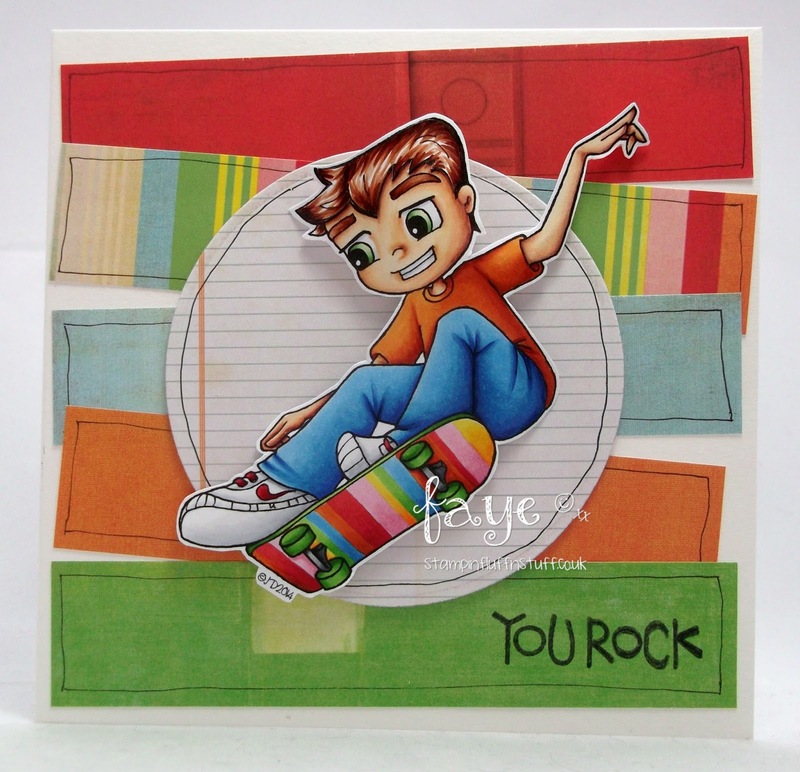 I think this card looks SO cool, Faye, it's fun, colorful and the design is fit for any young or teenaged boy! Clever design! He looks fine to me and I absolutely love your card. The wonky strips work so well with the boy image, brilliant. pffft! i'm having none of that, this is, as always, brilliantly coloured! Nooo... Ronnie doesn't rock: YOU ROCK, Faye!! Fun, bright and colorful card = LOVE! Well, I can't see any issues with this colouring - looks fab to me! As does the fun layout - great way to use some left-over strips of DP! This is just so fun and beautifully coloured with such cheerful colours. Great masculine design.